The idea of repurposing something with the history a door could have intrigues me. Who walked through it and what was once behind it? Our queen bedroom set was only a few years old when we decided we wanted a king size bed. 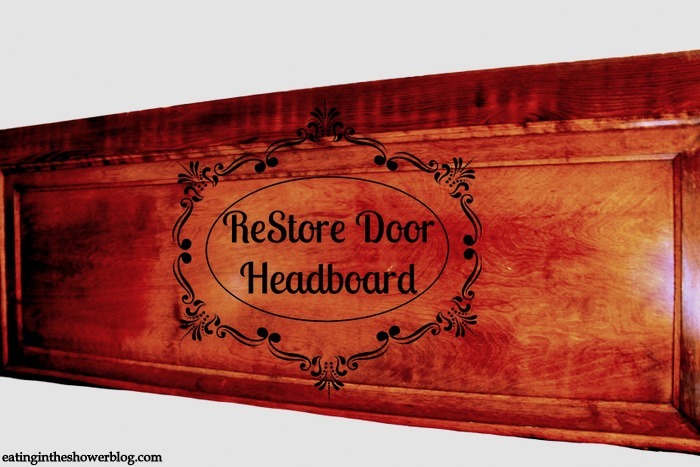 We went without a headboard for the new bed until I found this beautiful old door at the Habitat for Humanity ReStore for $50.00. There are so many adoorable headboard transformations out there burning up the Pinteresphere and I searched for the right door for a while intent on painting and adding a crown rail to the top. I couldn't believe my luck when I found one that matched our set so nicely, I didn't need to touch it. No sanding, no staining, no painting. This door needed nothing other than someone strong to turn it on its side! Well o.k., so it needed some two by fours, bolts, and brackets too. My husband bolted the door to 2x4 legs and secured with brackets at the top on each side and we had a brand 'new' headboard and look for our bedroom for $50.00! This door measures 32 X 78.5 and works great as a king sized headboard. Here is a closer look without all of the pillows. We would have spent much more for something with this look from a furniture store. The fact that we found this instead, saved it from a landfill, and helped a charity that provides people homes makes it that much more beautiful in ours. This really is stunning. The wood looks so rich and the color looks great with your bedspread. I love it. The wood is beautiful, and I like you starburst mirror too. Beautfiul! I love the rich color of the wood. Thanks for sharing! Hi Kate! Your headboard turned out beautifully. Lucky you to have found a door that would work so well with the rest of your bedroom set. Great job! Old doors are so beautiful and, like you say, have such an inviting mystery. Looks fabulous!